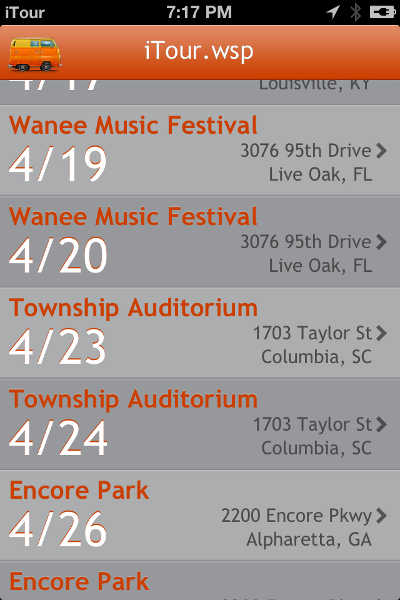 The iTour apps are the number one, user-friendly mobile apps for navigating your way around your favorite band's tours! With iTour, you’ll never be lost or left out of the know while planning and traveling to the next show. Find any facility within miles of your destination—from bars and liquor stores to hotels, campgrounds or gas stations—with just a few touches of your screen! "This app is perfect if you've got tickets to the shows, are traveling with the band, and want to see what's happened before or since. 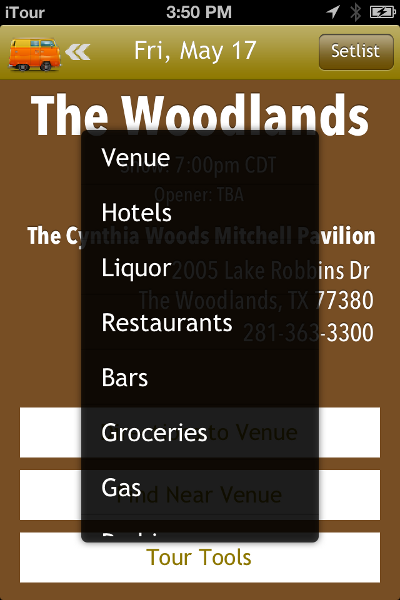 I love the fact that it shows you venues, hotels, restaurants, bars, gas, etc. 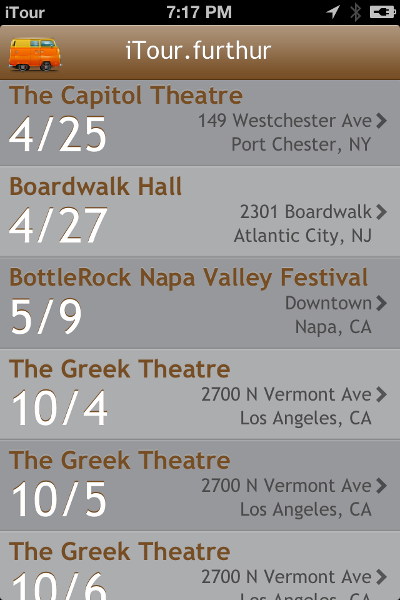 all around the venues. Basically everything you need and/or want. Awesome." You’ll never need to fumble with searching and entering addresses again when you have iTour! "Perfect for both on-the-fly adventure and advance tour planning, iTour is the touring companion that has been begging to be made since Phish and iPhones collided." Phish, Dave Matthews Band, Furthur, String Cheese Incident, Widespread Panic, & Umphrey's McGee. It takes just two clicks to open Maps. 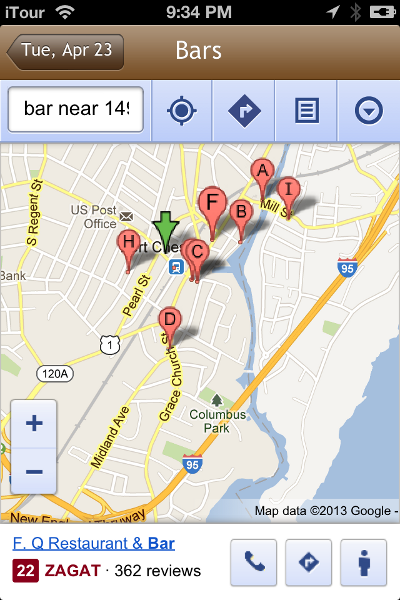 Find the venue and nearby gas stations, restaurants and hotels. Integrated with Cashortrade.org to help you find your facevalue tickets. 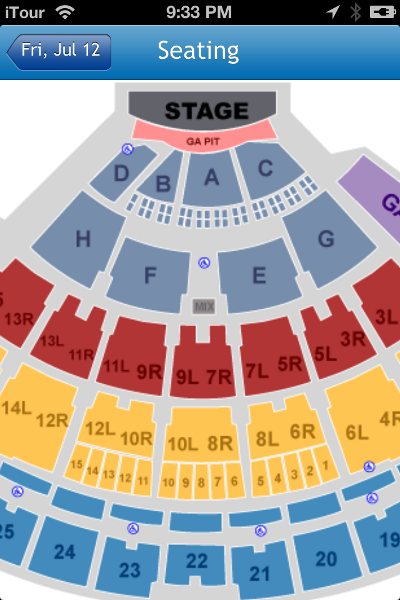 Use the seating charts to find your seats. 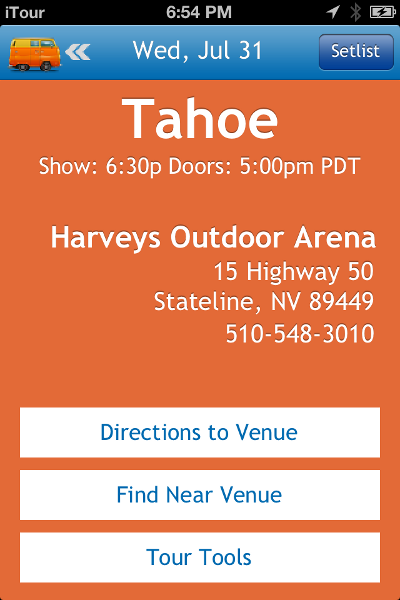 iTour will let you know at what time the show starts, the capacity of the venue and other show information. One-click to see what the world is saying about your band on Twitter. Review the Setlists, and then watch videos of your band on YouTube. Find local music on JamBase. Copyright © 2014 Sugarloaf App Company, LLC. All Rights Reserved. Not only will the iTour apps make sure you get where you need to go with Maps integration, the applications also link to crucial information to keep you informed on show day. 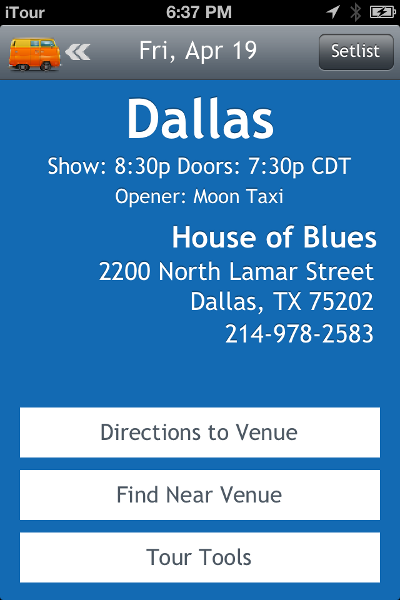 Find tickets and seating charts for the venues, YouTube videos and setlists for every show, or use Maps to find your way to parking lots, restaurants, gas stations, and other landmarks at each venue you visit. No more hassle and no more getting lost! Additionally, there are links to each venue’s website and integration with Twitter and YouTube, allowing you to keep up with your band's online community. The iTour suite of apps are the only must-have apps available for serious fans who want to streamline their showday experience. 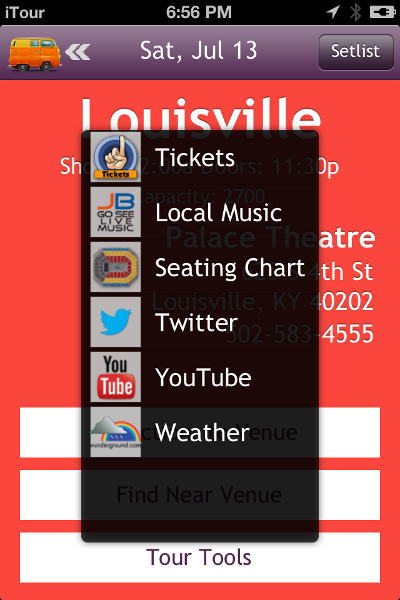 All the information about the bands, venues, and surrounding areas sits right in the palm of your hand. Why go searching for all this information when iTour brings it directly to your device for just a buck? Don’t go to another show without bringing iTour with you! Just $.99 on the iOS App Store and Google Play! Here is a selection of frequently asked questions we get. Click on the title to expand. The apps cost just $.99 each. WTF, its just a buck! Do you guys update it often? Does it work on all versions of iPod/iPhone? Are there a versions for Android? Can you make an app for my favorite band? Find us on email, Twitter or Facebook. Let's talk! Is your question not listed here? Do you have new features or bands to suggest? Head on down to our Contact section to find out how you can get in touch with us. Copyright © 2016 Sugarloaf App Company, LLC. All Rights Reserved.